When I am out and about in Wichita or at a Chamber of Commerce event, I am often asked about business and how the “new” company is doing. I usually reply that after nearly 16 months, the Walser Auto Campus and I am doing great. That usually elicits a chuckle or at the very least a smirk. And then I get to tell them about all the exciting enhancements to our business and our new website – WalserAutoCampus.com. As you can see in the photo above, this is not your ordinary “dealer” website. From the aerial slow pan across the front of the Greenwich side of the campus (don’t worry – BMW/MINI/Porsche/Acura coming soon! ), you can see why our collection of some of the most iconic brands in the world, all on one campus, is second-to-none. From new Porsches and Jaguars, to great Used Cars (priced from $7998 and up! ), we have what you are looking for! In addition, with our sister stores in the great state of Minnesota, we just might be able to get that new vehicle from one of our sister brands down here to you as well. And, best of all, at a negotiation-free, Walser Upfront Price, too! Cheesecake Factory Bakery is Now Open! The most talked about feature of our new Audi Wichita facility is our exclusive, licensed, Cheesecake Factory Bakery, located on the Club Level. Here you will find all of your favorite Cheesecake Factory treats from whole cheesecakes, cheesecake by the slice, to cheesecake bites. If you need something special to “WOW” your guests at your next dinner party, let us assist! If you need a special treat to reward your office, we can help! If you want to take your next Holiday gathering to the next level, we are there for you! Upon request, we may even be able to special order in a flavor we do not stock. Stop by Audi Wichita and see for yourself! You might even get a complimentary sample! Audi Wichita Now Open – Again! After opening nearly 2 years ago in a temporary structure, setting a few Customer Services standards along the way (thanks to our amazing customers! ), our brand new, state-of-the art Audi Dealership is now open! To enter, simply drive to the northernmost entrance on our 31-acre campus, or just past the temporary structure. Parking for Sales and Service are located on the northern side of the new facility. When you first walk in, the overwhelming size of the showroom (our largest to date!) will take a moments to settle in. The first item you will undoubtedly notice is the sweeping wall-structure that provides a visual barrier between the showroom where all of the GREAT Audi vehicles are displayed, and the tastefully designed working area for our Sales and Service teams. The second feature you’ll most likely notice is the 22 foot tall video wall that runs from the floor to the Club Level area on the second floor. Showing Audi Racing footage, current Audi vehicle offerings, or live sporting events. Simply amazing is the comment most often heard when guests and associates first see the display. Just behind and to the left of the video feature, is one of our Guest Lounges where you can only a complimentary hot or cold beverage, and in the mornings hours from 7:30 to 10:30 am, a selection of gourmet pastries. Current newspapers, a wall-mounted TV, a Children’s Play Area (complete with iPads and classic arcade game cabinet with 70+ classic arcade games loaded), and a fireplace. Also in this area is a large selection of Audi branded merchandise, clothing, and accessories for the Audi fan in your home. Walk directly to the right of the video feature and you will find our Vehicle Reveal Center and Service Consultation areas. The Vehicle Reveal Center is really where the Audi Experience begins…..when you first take delivery of your new or certified pre-owned Audi. The room features a turntable allowing you to see all the beautiful angles of your Audi. Continue around the corner and you will see our Service Consultants reviewing the status of Audi vehicles in for service. As you walk by the Service Consultation area, you will notice the glass doors swooshing open and closed (Star Trek, anyone?) that take yo in to the Audi Service Drive where guests are dropping off and picking up their vehicles from our Service Team. Across the Service Drive is the Retail Parts Counter and a glass wall that allows you to look into the Service Technician area where our amazing, experienced, and factory-certified technicians are providing valuable maintenance on your Audi. And now for the most amazing feature of our new Audi facility….Club Level. Club level is where you can get away from it all with our all-weather Rooftop Terrace, the Audi Sport Theater, the Quattro Cafe with Cheesecake Factory Bakery offerings (an Audi first and ONLY at Audi Wichita! ), and the luxurious Audi All Access VIP retreat, an exclusive perk of ownership for our Audi owners. This area simply has to be seen to believe! Ask an Associate for a tour of the Club Level experience. And while you are there, maybe they’ll have some samples of some of the cheesecake! The new Audi Wichita is unlike anything you have ever seen at an automobile retailer before. Experience it today! Click here to visit our Audi Wichita Facebook page! Like us for updates and event notifications! MINI of Wichita – NOW OPEN!!! After eight years of campaigning to bring a MINI Franchise to Wichita, the Wichita Luxury Collection is pleased to open our TENTH brand in Wichita! Starting Monday, February 22, MINI of Wichita will be ready to serve guests with both new and pre-owned vehicles to lease and purchase, parts, and SERVICE!!! As an added bonus, ALL current MINI motorers (Owners) that purchased outside of Wichita will be grand-fathered into our award -winning Luxury Experience suite of amenities. Unlimited Courtesy Washes, Intrust Bank Arena VIP Parking, and starting up again in 4 weeks, our one and only Mobile Wash Experience. If you would like to see our current specials, just Click this Link…. The Wichita Luxury Collection is proud to announce the newest member of our family – MINI of Wichita! Scheduled to open in January, MINI of Wichita will be fully functional in our temporary facility. New (taking orders now!) and Pre-Owned Sales, Parts, and factory authorized Service for warranty and general maintenance will all soon be available to our MINI owners. 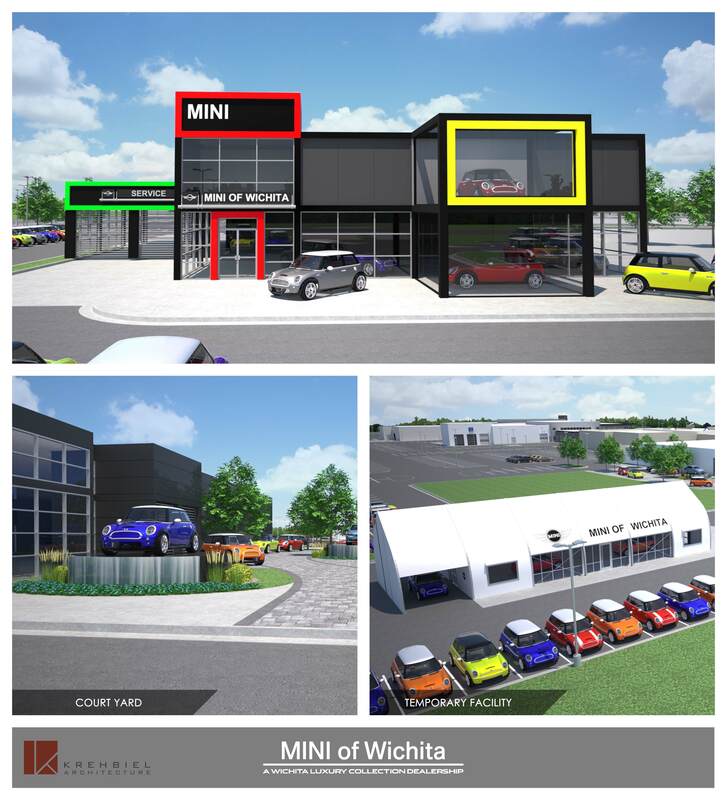 Located just west of Greenwich on East 13th Street, MINI of Wichita will be the first dealership to open of our second “automotive row” – a perfect complement to our nearly completed automotive row on Greenwich Just north of east 13th Street. MINI of Wichita will be joined by BMW of Wichita, Porsche of Wichita, and Acura of Wichita, all of which will be breaking ground before the end of this year. With Jaguar / Land Rover now open, joined by Audi, Lexus and Mercedes-Benz / Sprinter, we will have TEN luxury franchises, all on one 30 acre campus. We couldn’t be more excited! Be among the first in Wichita to get on the list to order YOUR MINI. CLICK HERE to send us an e-Mail. You may also dial us at 316.719.8300 to discuss a New MINI with our MINI Sales Manager. 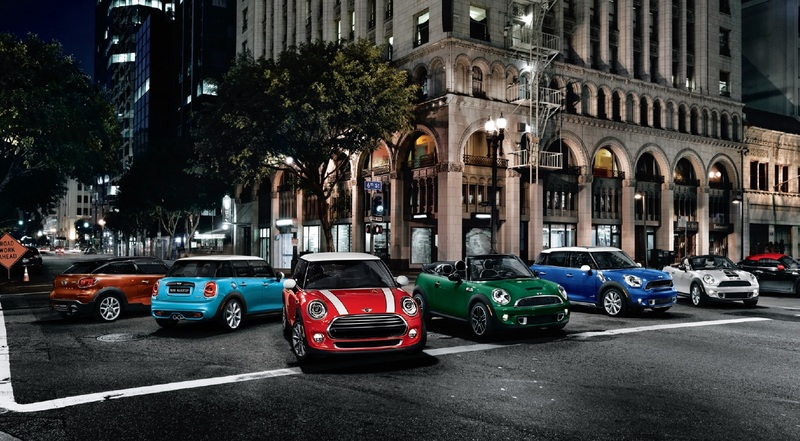 What will you name your MINI? 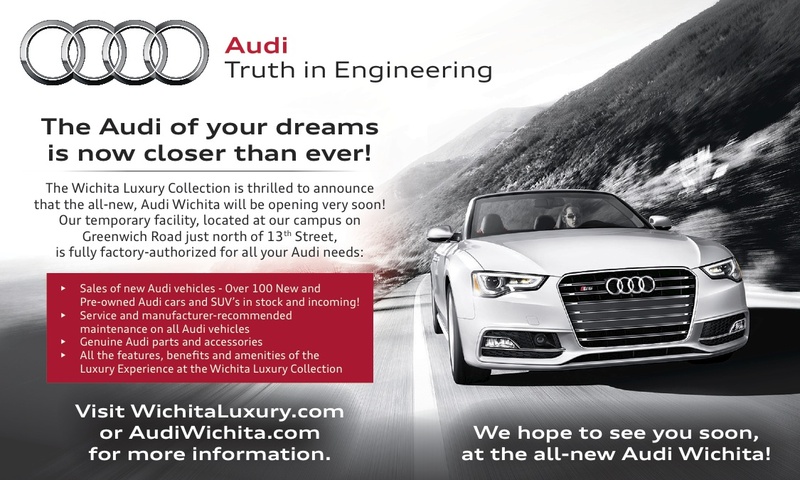 Audi Wichita – Opening Soon! The clock is ticking for YOUR opportunity to see and hear what all the buzz is about. In fact, over a dozen guests have already reserved their Audi and will be among the first in Wichita to acquire a new Audi. Soon, our Audiwichita.com website will go live with everything you need to know about Audi and the formidable Audi line-up of sedans, coupes, SUV’s, and cabriolets. Vehicles starting at $29,900 and going well over $200,000 (and everything in between). In the meantime, check out our main website, www.wichitaluxury.com , for details and the big announcement of when we will “start the engines” of the exciting new Audi Wichita….. If you have driven by our new campus just north of 13th on Greenwich, you may have noticed a very unique structure on the north side of the all-new Lexus of Wichita location…. It’s not a fireworks tent….. or a replica of the Denver Airport…. It’s the TEMPORARY home of Audi Wichita! A state of the art temporary building fully functional with New and Certified vehicles for purchase and lease, factory trained technicians for service, and a fully stocked parts department. In a few short months, the REAL Audi Wichita will break ground directly behind the temporary facility….so you can keep tabs on our progress while waiting for service, or our popular complimentary vehicle wash.
We hope you are as excited as we are to bring one of the most asked for franchises to Wichita! 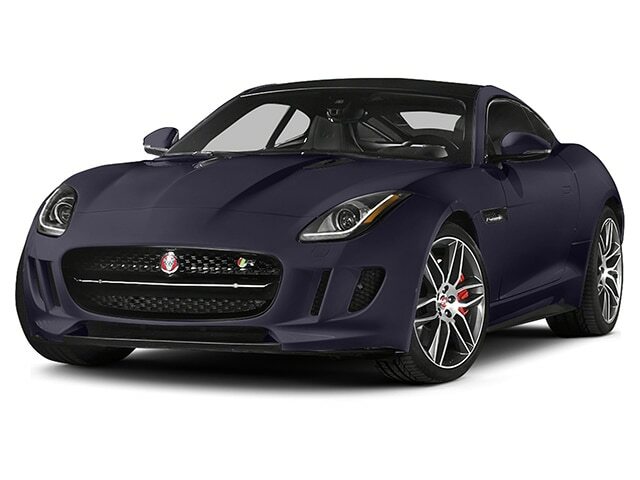 The Jaguar F-Type Coupe has arrived and this cat is ready to prowl the streets of Wichita! Starting at $65,000, The standard features of the Jaguar F-TYPE Base include 3.0L V-6 340hp engine intercooled supercharger, 8-speed automatic transmission with overdrive, 4-wheel anti-lock brakes (ABS), integrated navigation system, side seat mounted airbags, driver and passenger side airbag head extension, airbag occupancy sensor, automatic air conditioning, 18″ aluminum wheels, cruise control, ABS and driveline traction control. 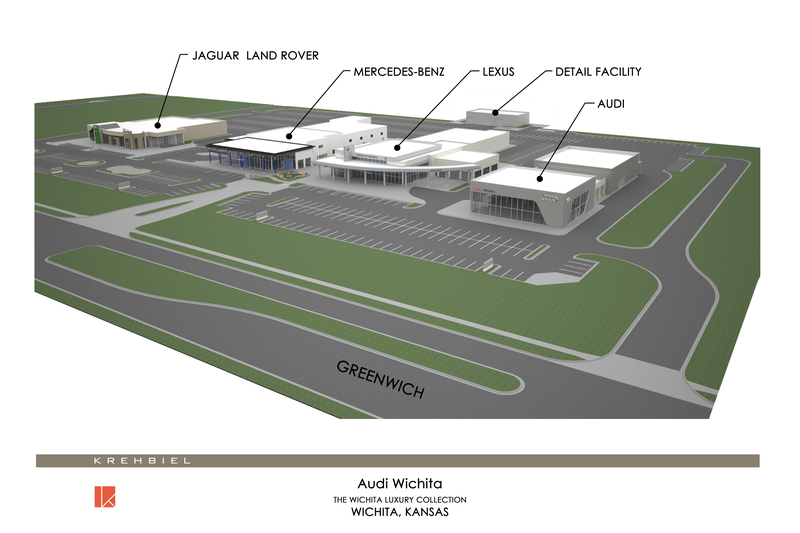 Updated June 26th, 2014 – Jaguar Wichita and Land Rover Wichita have broken ground and walls are rising! Our new Audi Wichita temporary facility is nearing completion and we may be open as soon as August 1st with new Audi inventory! If you just can’t wait to get your hands on a new vehicle, we have a selection of Pre-Owned Audi and Land Rover vehicles for you to choose from with an offer so amazing, you just won’t believe it…..
Stop or drive by today! Updated February, 2014 – After many months of anticipation, we can finally announce the landing of TWO luxury franchises in Wichita, Audi Wichita and Land Rover Wichita. Construction on the Jaguar / Land Rover facility will start in May 2014 with completion expected to be in April of 2015. Audi will open in 120-180 days in a temporary facility with the permanent facility to break ground in July of 2014. Expected completion of the Audi Wichita building will be in July of 2015. 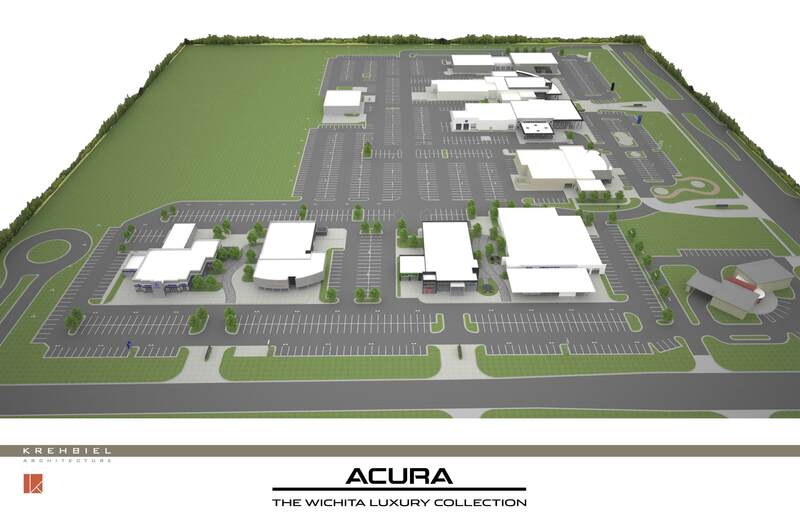 At that time, will break ground on the new Acura of Wichita and Porsche of Wichita with an expected opening of those new buildings in July of 2016. Here are some nice articles from around the local media for more details.